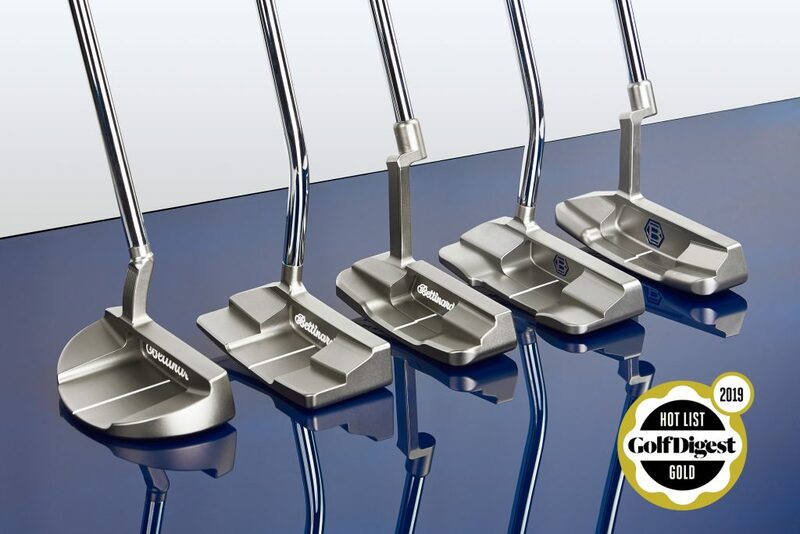 Bettinardi Golf, precision milled putter OEM, celebrating their 20th year in business, announces that six of their 2019 putters were honored with the highly coveted 2019 Golf Digest Hot List award. Golf Digest made the announcement on January 28th, 2019 and will follow up with full coverage of the announcement in the March issue of Golf Digest, currently available on newsstands. The 2019 Queen B Series lead the way with all three models receiving the top honor of Gold Medals for the Hot List awards. The most elegant and stylish appearance across the Bettinardi 2019 lineup, the Queen B Series features three unique head shapes, the re-defined Queen B 5, Queen B 6, and the entirely new Queen B 10. Developed from Tour prototype to reality, this traditional mallet offers superior performance with its trademarked crescent milled neck optimal toe hang. The 2019 Queen B lineup is complemented by a Lamkin deep-etched corded Tiffany blue grip and matching headcover, while the Queen B Series remains desirable models for everyone. Completing the Golf Digest Hot List Gold for Bettinardi was the Studio Stock 2, their traditional blade putter and the all-new, first ever Studio Stock 28 Slotback putter. The Studio Stock lineup features five striking putters precision milled from 303 Stainless Steel in a rich Platinum finish. Each model is hand-polished with clean lines and beautiful aesthetics that are complemented by deep mill marks throughout. The entirely new Studio Stock 38 was also awarded by Golf Digest on the Hot List and was engineered from the idea to bring a more rounded, compact, cavity-back mallet to the Studio Stock line, with high MOI, forgiveness, and easy alignment. Two-hundred and twenty-two clubs were put to the test that is dictated upon 45% Performance, 30% Innovation, 20% Look/Sound/Feel and 5% Demand in the annual golf equipment awards going on 16 straight years. “All of our 2019 putters have been proven on the games biggest stage, along with rigorous testing at our headquarters where we machine the entire Bettinardi range fifteen feet from my office. In celebrating our 20th Anniversary, this lineup brings huge satisfaction in the amount of success we’ve had on Tour, the aesthetic of the entire range is simply beautiful and my son Sam Bettinardi has really made his mark on the design of our putters. Continuing to win on Tour to start 2019, and now adding the Gold medals to our lineup, is a huge satisfaction to me in our 20th Anniversary.” Said Robert Bettinardi. All Bettinardi putters are designed and crafted under the discerning eye of founder and president Robert J. Bettinardi and Sam Bettinardi outside of Chicago, Illinois at their state-of-the-art manufacturing center in Tinley Park. With over 80 worldwide Tour victories and counting, Bettinardi putters have been proudly precision milled in the USA for 20 years. For more information, please contact Director of Marketing Nick Martini at nmartini@bettinardi.com or 708-802-7400. For all UK Marketing material, please contact Mark Paszkowski at mark@jsint.com.